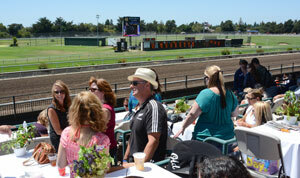 Feel the thrill of live horse racing at its finest on the turf and dirt tracks at the Sonoma County Fair. Located trackside, our boxseat tables have the ideal setting for an exciting day at the races. 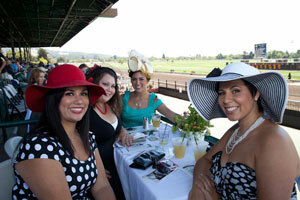 Enjoy the most exciting live thoroughbred racing hosted at Northern California's only fair turf track! Wine Country Racing is a great way to treat your clients, employees, business partners, friends and family to a day at the races. Limited availability so don’t delay! We offer individual tables on the North side of the grandstand or a group area on the South side with a paddock view. Reserved table for 4 within the box seating sections. Includes table service. Drinks, food & required Fair admission sold separately. Paddock view table seating includes several tables in one of the best box seat areas in the house (up to 26 people). Overlooking the beautiful paddock are, guests are invited to catch the post parade without ever leaving their seats. Entertain clients and promote your business with a company banner on the railing. Includes Fair Admission and official racing programs for the entire group. Food and drink are sold separately. Catering options available for additional fee. Available for purchase at the box office only. Reserved seating, tables of 8 with umbrellas, closest seating to the race track!